We are a little obsessed with popcorn in our house. I have it at least a few times a week and when holidays roll around, I like to jazz it up. In the Fall we made colorful Fall Popcorn and we celebrate birthdays with Birthday Popcorn. So with Valentine’s Day right around the corner, it was only natural that we make Valentine’s Day Popcorn. Pop your popcorn and place in a large bowl. If you are using microwave popcorn, one large bag should do. When the popcorn is ready, heat up one cup of red candy melts in the microwave. The melting directions are on the bag but basically you microwave them and stir every minute or so until the melts achieve a thin, pour-able consistency. Pour 1/4 of the melted candy onto the popcorn and toss around. Add some heart marshmallows and M&Ms and toss. Repeat these steps until you have used all the melted candy. Add some sprinkles and toss once more. How many marshmallows and M&Ms you use are a matter of personal preference. I probably used 1/2 cup of M&Ms and 1 cup of marshmallows. 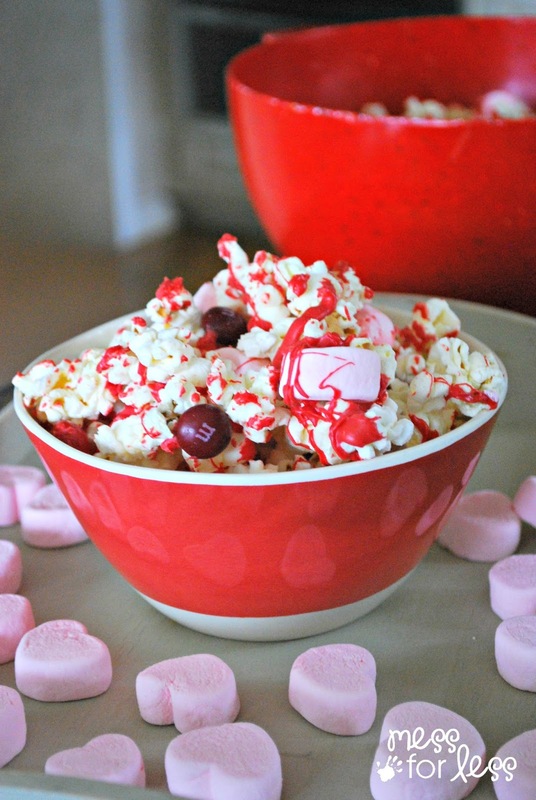 Allow the candy melts to harden and the Valentine’s Day Popcorn is ready to enjoy. 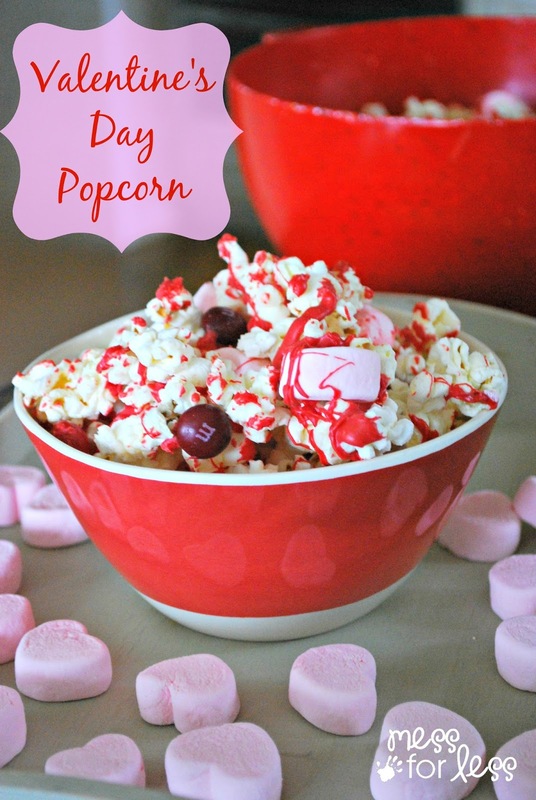 My favorite thing about this Valentine’s Day Popcorn is how the melted candy will harden around the popcorn, M&Ms and marshmallows, making a yummy treat. My kids were quick to gobble it up. Hope this treat makes your Valentine’s Day a little sweeter! Hope you enjoy it Louanne! I like your popcorn idea! I must try it! Thanks! It went pretty quick! Let me know how it turns out Simona.